Johannes O. Müller (John Miller) was born on February 5, 1841 in Norka, Russia, the son of Johannes Müller (born 1802) and Emma Glanz (born 1807). John first married Margaretha Traudt on January 9, 1862 in Norka. Margaretha was born in Norka on December 20, 1939 and died during childbirth on January 14, 1865. John was married for the second time to Katharina Elisabeth Hinkel on March 29, 1866 in Norka. This union resulted in four children: Henry (born 1868), John Jr. (born 1870), Anna (born 1872) and Katharina Margaretha (Kate) who was born January 26, 1873. Tragically, Katharina Elisabeth, died on April 5, 1875 of typhoid fever. 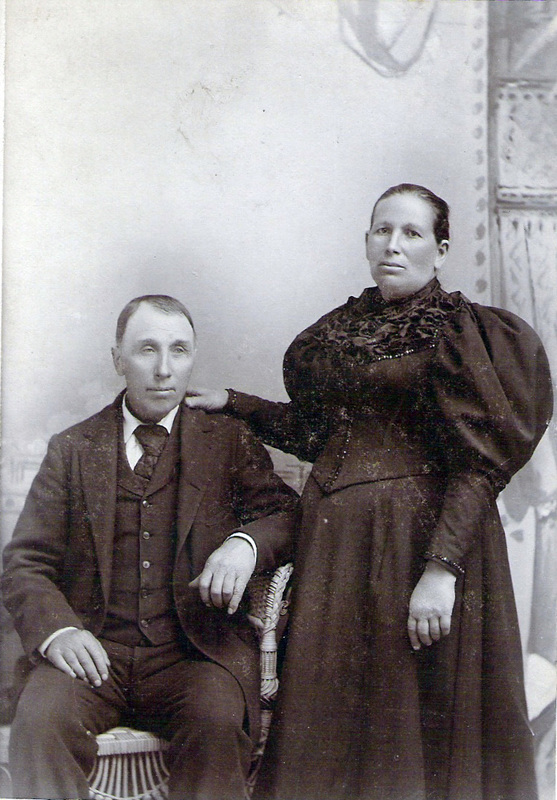 John married a third time to Anna Elisabeth (Alice) Giebelhaus on July 13, 1875 in Norka. Alice was also born in Norka on June 6, 1850, the daughter of Conrad Giebelhaus (born 1820) and Katharina Yost (born 1819). Alice had a daughter, Emma, from an earlier marriage. Emma was four years old when Alice married John. Alice was said to have a very feminine sense of style and an appreciation of beauty. She was both intelligent and ambitious. John and Alice would soon start their own family. After three miscarriages, ​a son, Adam was born in 1880. Twin daughters Dorothea (Dora) and Katharina (Katy) followed in 1882​. Portrait of John and Anna Elisabeth Miller. Photograph courtesy of Karen Drier Esayian. In early 1887, John and Alice made a decision to go to America. John later reported that their decision was based upon the recent famine in the Volga region, the desire for economic betterment and the influence of friends that were already living in America. On May 9, 1887, they loaded their children and belongings into a horse-drawn wagon and were driven by relatives to the railroad station in Saratov. From Saratov they traveled by train across Western Europe and arrived at the port city of Hamburg. They found that their home on the Volga lagged well behind the progress that had been made in modern Germany. Their archaic German dialect was met with with disdain and some people referred to them as "Russian cattle". Any fond feelings for their ancestral homeland were soon abandoned. Portrait of the John and Alice Miller family in Lincoln taken in 1888. Photograph courtesy of Karen Drier Esayian. By 1890, John and Alice decided it was time to move once again. The Miller's (with exception of Henry) traveled to Oregon with the Conrad Repp family aboard the Union Pacific Railroad from Omaha to Portland. They arrived in Albina on October 27, 1890. After seeing the Willamette River and beautiful green hills surrounding the city, John turned to Alice and said, "Now we've finally found our home." The Miller family settled into their new home in Albina, Oregon which was then an independent suburb of Portland. They were first taken in by Conrad and Anna Maria Schnell who had arrived in 1888. Emma would marry the Schnell's son, Peter, in 1891. A portrait of Alices's daughter, Emma. Emma married Peter Schnell in 1891. Photograph courtesy of Karen Drier Esayian. With such a large family, John and Alice had difficulty finding a home to rent, In desperation, they rented a one-room store building at the corner of Russell Street and Union Avenue (now MLK Blvd.). They remained in this location for six-months until their home was built at the corner of 7th and Morris Street. Henry had now joined them in Portland with his fiancé, Margaretha Elisabeth Fink. They were married in the Miller's home on November 9, 1890. 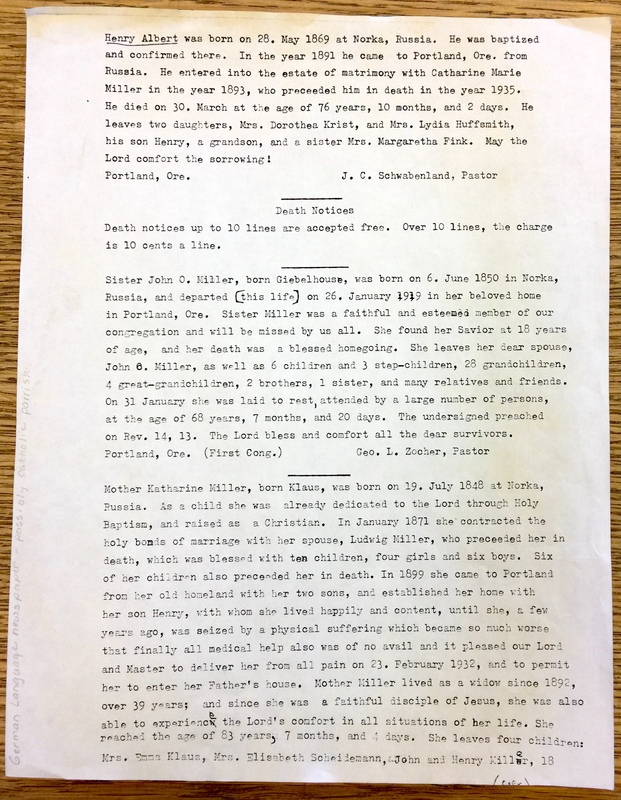 John and Alice welcomed another son, John William, to the family on June 4, 1891 a few weeks after moving into their new house.​ All of the Miller children would later be entitled to become members of the Albina Pioneers Society (established in 1923). John and Alice were instrumental in the founding of the Ebenezer German Congregational Church, established in 1892. Dora married John Conrad (J.C.) Schwabenland. One of Dora and J.C. Schwabenland's children is the noted German Russian historian, Emma Schwabenland Haynes. In her unpublished thesis titled, My Mother's People (1959) Emma Schwabenland Haynes recounts many stories about her Giebelhaus and Miller families. "When Grandfather Miller arrived in Portland on October 27, 1890 he found about twenty Volga German families living east of the Willamette River between Tillamook and Knott Streets. Technically this area was not part of Portland, because until 1891 Albina and East Portland were incorporated as independent communities with their own mayor, town hall, banks, jail, etc. 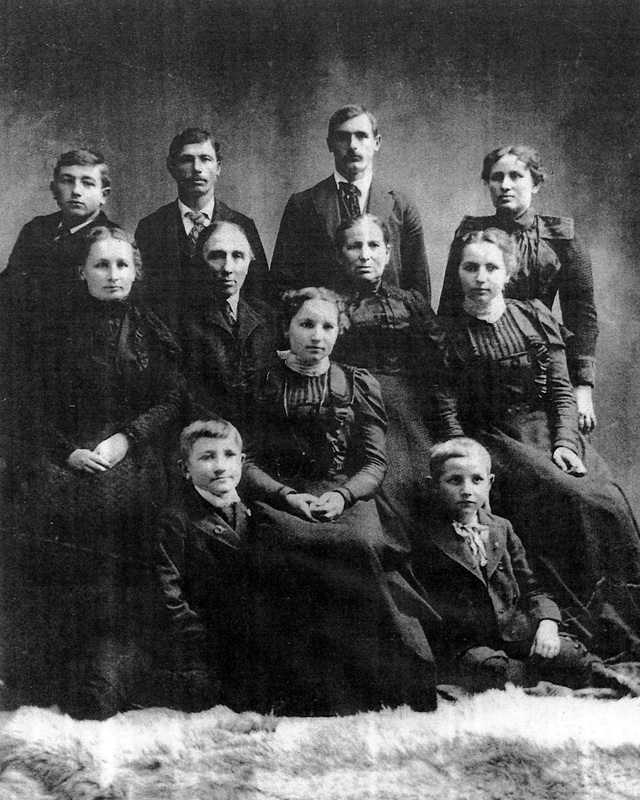 The first Volga Germans had left Iowa for Walla Walla, Washington, but after spending three months in that city, they had moved on to Portland as early as 1882. Other old timers came by boat from San Francisco or by way of Nebraska. Most of them were from the colony of Norka, and it is probably due to their influence that so many other people from that village eventually settled here. The names of the earliest pioneers include the following individuals: John Schnell, Conrad Schnell, George Betz, Ludwig Spady, Peter George, Constantine Brill, Henry Meier, Conrad Schwartz, Peter Gerloch, Adam Schwartz, Peter Wolf, Adam and David Schwindt, and a Frühauf family, all of whom had come before 1889. Upon the arrival of grandfather's party, the Volga Germans who were already living in Albina opened their homes in the hospitable fashion for which they were famous. Because of their isolated existence in Russia they had become a very clannish closely-knit people, and the arrival of a Nachbar (neighbor) from their native village was always the occasion for a hearty celebration. No matter how poor the families might be, they would set their tables with the best possible food, and regardless of how crowded they already were, they gladly surrendered their beds to the newcomers, and placed their own children on the floor upon hastily constructed piles of quilts. In the 1890's there was a tremendous difference in the appearance of the residential district around present-day Union Avenue. When grandfather bought his lot, all of the land east of 7th Avenue was still covered with forests; and although the trees had been cut down at the corner of Morris Street, he had to pull out the remaining stumps before he could begin to build his home. For the next ten years it was unnecessary for him to spend a single cent on fuel, because he and his boys could cut down all the trees that they needed in the lots across the street. The logs would then be piled up until they were dry enough to be used." 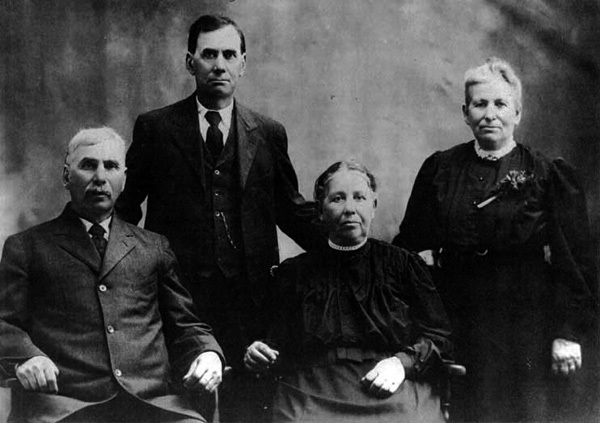 John O. and Anna Elisabeth (Alice) Miller family circa 1895 in Portland. Back row from left to right: Adam, Henry, John and Emma. Middle row from left to right: Kate, John Sr (John O. ), Anna Elisabeth (Alice), Dorothea (Dora). Front row from left to right: George, Katy and John W. as a young boy. Photograph courtesy of Karen Drier Esayian. Alice's siblings, Johannes (John), Heinrich (Henry), and Anna Maria (Emma) also settled in Portland. The Giebelhaus siblings. 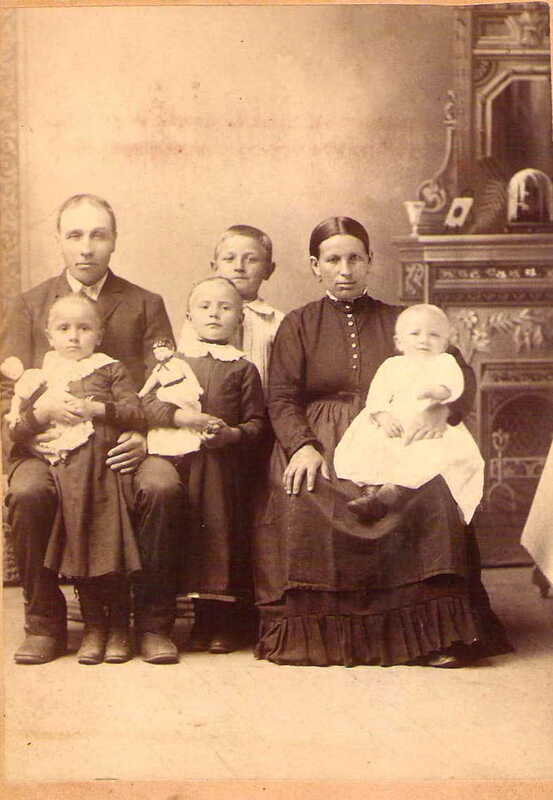 From left to right: Johannes Giebelhaus 1841-1922; Heinrich Giebelhaus 1847-1920; Anna Maria (Emma) Giebelhaus Krieger Klaus (1844-1931); Anna Elisabeth (Anlis or Alice) Giebelhaus Miller (1850-1919). Photograph courtesy of Karen Drier Esayian. Katharina Margaretha (Kate) married Heinrich Albert in 1893. Katy Miller married George Repp, a grocery store owner and one the founders of the Volga Relief Society along with John W. Miller. George E. Miller was born on March 23, 1888 in Nebraska. He founded Miller Bros. Sheet Metal and George E. Miller Lumber Company. George worked closely with his brother John W. Miller. John W. Miller was born on June 4, 1891 in Portland. He founded Coast Fir Lumber Company and Coast Fir and Cedar Products Company. During the early 1920's, when a severe famine swept the Volga German colonies, John W. Miller was one of the community leaders who founded the Volga Relief Society. Along with George Repp, these two men helped thousands escape death from starvation in Russia. In 1900, the family lived at 434 Morris Street. By 1910, the Miller's had moved to a new home at 435 Stanton Street. 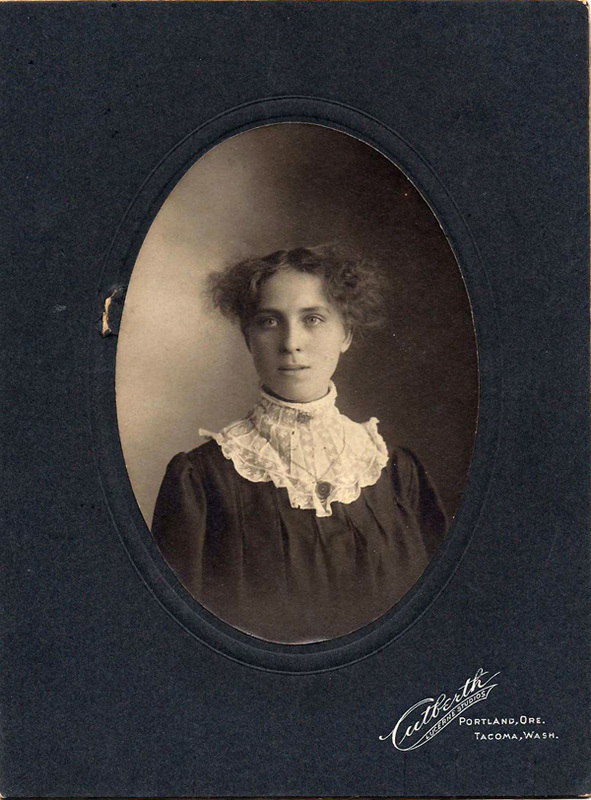 Alice died on January 29, 1919, a victim of the Spanish Influenza, and was buried at the Rose City Cemetery. 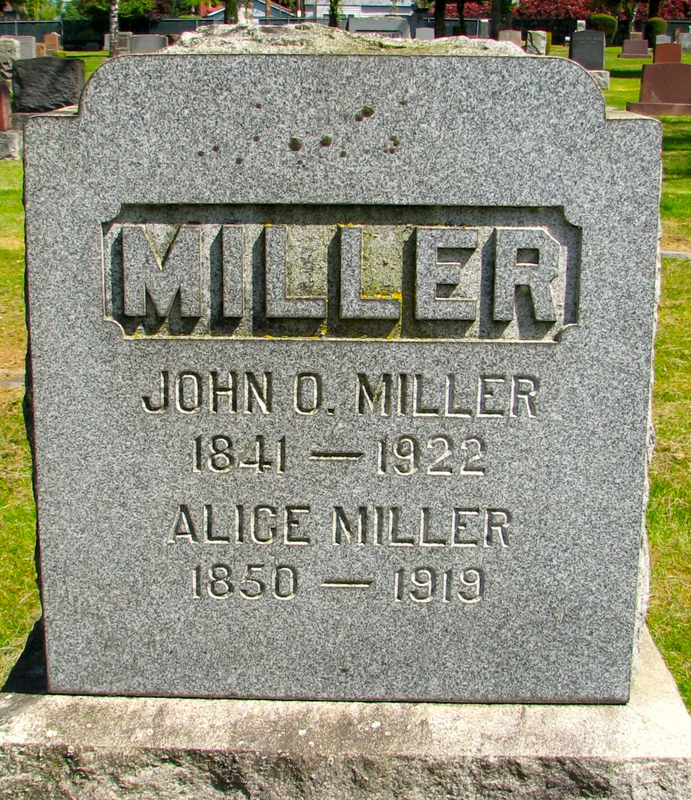 John O. Miller died on January 29, 1922. John's death came after several weeks of suffering from injuries sustained when he was struck by a speeding car while returning home from a midnight prayer meeting. His funeral was held at the Ebenezer German Congregational Church which he had helped organize in 1892. All of the ministers from the nearby German congregational churches attended John's service along with a packed building full of family and friends. During the service the 90th Psalm was read in German. His coffin was then carried out of the church and transported to the burial site next to his wife Alice. Grandfather had the respect of everyone who knew him. He was a man of peace -- a quiet person who had the rare ability of knowing when it was better to remain silent. He was a good man in every sense of the word. John O. and Anna Elisabeth (Alice) Miller. Photograph courtesy of Karen Drier Esayian. Haynes, Emma Schwabenland. My Mother's People. Unpublished manuscript. 1959. Print. Haynes, Emma Schwabenland. Emma's Thesis - The German-Russians on the Volga and in the United States. AHSGR Central California Chapter, 1996. Print. Zocher, George L. Obituary for Anna Elisabeth Miller.